You have to read a rubric carefully to get it right. First, scan the elements in the left-hand column for crucial elements. What is listed first? That’s probably the most important criterion. Look at each element in more detail to consider what it means to your teacher/grader. Start with the highest-scoring column (often a 4 on a scale of 1-4) and read what an "exemplary" work looks like. Then, look at the next column over (the 3), and try to identify what the differences are between a score of 3 and a 4. For extra clarity, look at the lowest score (the 1). How precisely can you gain or lose points? Look at the rubric below, which I created using RubiStar. Consider this: what do you have to do to get a 3 in every category? What small changes could you make to get a 4 in each category? There is one clear, well-focused topic. Main idea stands out and is supported by detailed information. Main idea is clear but the supporting information is general. Main idea is somewhat clear but there is a need for more supporting information. The main idea is not clear. There is a seemingly random collection of information. The introduction is inviting, states the main topic and previews the structure of the paper. The introduction clearly states the main topic and previews the structure of the paper, but is not particularly inviting to the reader. The introduction states the main topic, but does not adequately preview the structure of the paper nor is it particularly inviting to the reader. There is no clear introduction of the main topic or structure of the paper. The conclusion is strong and leaves the reader with a feeling that they understand what the writer is "getting at." The conclusion is recognizable and ties up almost all the loose ends. The conclusion is recognizable, but does not tie up several loose ends. Writer makes a few errors in capitalization and/or punctuation that catch the reader\'s attention and interrupt the flow. A focused, detailed main idea is the most important thing in this rubric. That main idea must be "supported by detailed information" to get a 4, rather than "supporting information is general" (3), and definitely not "seemingly random collection of information." You can imagine that students have tried to submit "random" information, not realizing or not caring about the goals of the assignment. You know that you can make "1-2 errors in grammar or spelling" and be okay, but not "more than 4 errors that distract readers from the content." From taking the time to dissect this rubric, you'll know what to do and also know why the teacher cares about it. Your points should be clear, and the reader shouldn't get distracted. Let's look at another rubric that values clarity. The SAT writing section has a "comprehensive rubric" that they call a "scoring guide." It's the same idea as the rubric I described above, but it isn't broken down into clear components. Let’s walk through this in more depth. Let's look at the 6 (highest score) and compare that to a 5. The two categories are almost exactly the same. A score of 6 demands "clear and consistent mastery" versus the "reasonably consistent mastery" of a 5. A 6 "effectively and insightfully develops a point of view" where a 5 "effectively develops a point of view." You might think: the only different is insight? How do I develop insight? Have I learned anything from reading this scoring guide? Yes. The description of a 6 includes the word "clear(ly)" three times. What you should take away is the importance of practice and mastery of clarity to receive a 6. Graders with their limited time need your writing to be clearly excellent, not good-but-you-have-to-squint-and-re-read-it-to-be-sure. In this case, other writing skills are not as important as the elements that are listed. Save your originality and alternative narrative structures for later — this essay is not the right place for them! Now, let's be fair to the SAT; the GRE scoring guide and the TOEFL scoring guide are similarly vague. 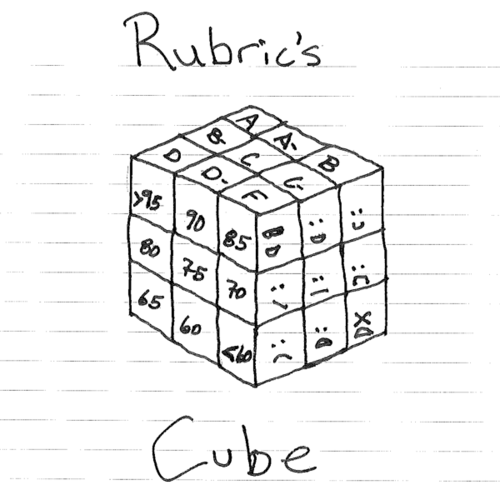 The good news: most rubrics for classes and papers are much more straightforward! From my experience as an SAT tutor in the MIT and Harvard area, I’ll reiterate this with emphasis: If you receive a rubric, it is worth your time to read it carefully. You should have concrete ideas of what you should and should not do. When in doubt, any teacher who has taken the time to write a rubric will likely be willing to take the time to clarify questions you have about it. Now, you get a turn to be the grader. 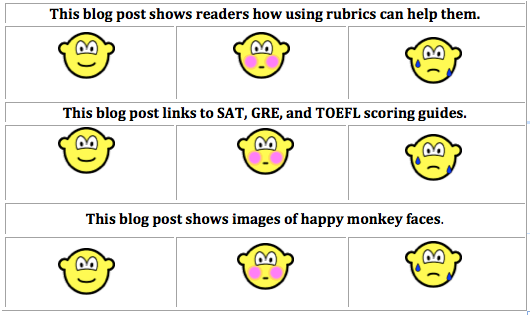 Try grading me using the rubric below! Then go and ask your teachers for rubrics for your essays, or look at the scoring guides for your next test. My fellow SAT verbal tutors in Boston have also written excellent posts you may find useful — here’s two: 4 Tips on Writing the SAT Essay, and comparing the ACT and SAT essay sections, If you need additional one-on-one help, feel free to reach out! Cambridge Coaching has a number of awesome SAT tutors in Boston, New York, and online.